APRIL EASTER SPRING SPECIAL -- BOOK NOW! **Special pricing provided instantly. Price Quote on VRBO/Homeaway is accurate. April 18-April 22, 2019 Easter Weekend Special for 3+ Night Stays. Good for new reservations made on or after April 16, 2019, and based on availability. No refunds or discounts on previously made reservations.Cannot be combined with other specials or weekly rate; minimum night requirements apply. Nightly rate does not include taxes/fees. Specials may be discontinued without notice. APRIL SPRING SPECIAL -- BOOK NOW! *IMPORTANT: Midweek Specials -- Stay must begin and end within the stated nights (Sunday-Wednesday and cannot include Thursday-Saturday nights). Should your booking request include a Thursday-Saturday night, the rates will be reverted to the normal April Spring seasonal rate ($195/Nt +taxes/fees) once your reservation is submitted. **Special pricing provided instantly. Price Quote on VRBO/Homeaway is accurate. April 14 -May 1, 2019 Spring Specials for 2+ Night Stays. Good for new reservations made on or after April 12, 2019, and based on availability. No refunds or discounts on previously made reservations.Cannot be combined with other specials or weekly rate; minimum night requirements apply. Nightly rate does not include taxes/fees. Specials may be discontinued without notice. This incredible luxury condominium is beautifully decorated and sits right on the rocky edge of the Pacific Ocean at THE VILLAGE AT NORTH POINTE. Perfect for a romantic weekend to escape the stresses of everyday life, or a cozy family retreat. Picture yourself sitting in the oceanfront living room watching the winter storm waves crash on the rocks in front of you. Watch the resident whales dancing in the beautiful Pacific Ocean while relaxing by the warm gas fireplace. Wake up to the sound of the waves in the over-sized, oceanfront king master suite or relax in the jetted master suite bathroom tub. Enjoy the amenities of the unit including Living room PLASMA TV, gourmet kitchen where you can prepare your meals on stainless steel appliances surrounded by the luxury of the granite counter tops. This unique floor plan boasts beautiful angles giving it the maximum oceanfront windows in the building. The Beacon will become your favorite Oregon Coast getaway. The Beacon provides the ultimate in upscale luxury coast accommodations at the best rates around. Enjoy the amenities of the unit including NEW PLASMA TV, all NEW LIVING ROOM furniture, gourmet kitchen where you can prepare your meals on stainless steel appliances surrounded by the luxury of the granite counter tops. This unique floor plan boasts beautiful angles giving it the MAXIMUM OCEANFRONT WINDOWS in the building. Now Wireless High Speed Internet provided in this unit. Deposit of 50% due at time of booking reservation. Remainder of balance is due 45 days prior to arrival. EQUIPMENT FAILURE-- Although we cannot guarantee the operation of all appliances, utilities and equipment (e.g. air conditioning, Wi-Fi, pool equipment, hot tubs, kitchen appliances, televisions, etc.) our staff makes every reasonable effort to ensure that the equipment, utilities and appliances are in working order. Agents, authorized employees or repairmen may enter the premises for purposes connected with repair, care, or maintenance of the rental property. We will do our utmost to have any malfunction repaired in a timely manner. However, Blue Pacific assumes no liability for malfunctioning items and does not offer refunds for equipment, utility or appliance failure. Please contact the office immediately if you encounter a problem. Beautiful Condo with fantastic views. We have stayed at the Village at North Point many times while vacationing in Depoe Bay. The Beacon has the most fantastic views of all. It is such a pleasure to have an ocean front master bedroom. The entire condo is so comfortable. We especially appreciated having two rocker recliners which are sometimes hard to find. The kitchen is well equipped and Blue Pacific Rentals are a great management company. We highly recommend this unit. Words cannot describe the beauty of this place. The view is spectular and The Beacon has all the comforts of home and then some. Nothing was left to chance in the Beacon. 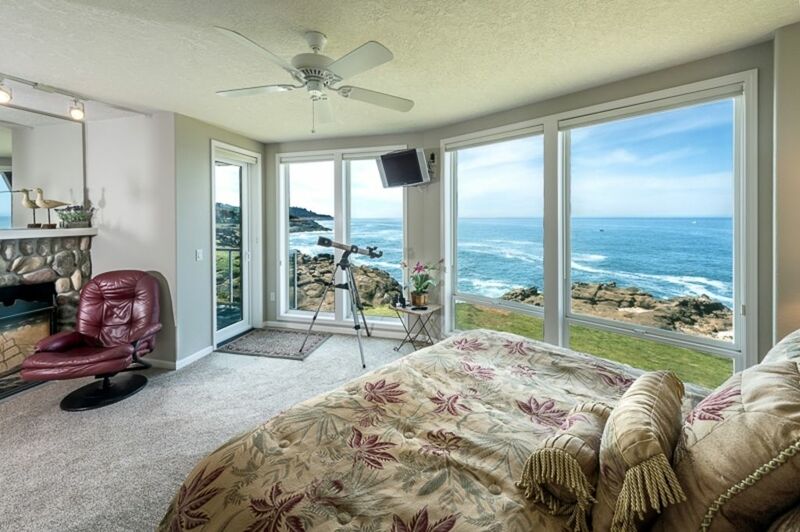 My husband and I have seriously talked about moving to Depoe Bay but I must have this unit. Everyone at The Village at North Pointe was fantastic and we made friends with many of the residents. It felt like home, only better. I love this place!!!!!!!!!!! I hesitated, at first, to give such a glowing review due to selfish reasons (I want availability), but this property must be experienced. We loved the opportunity to view whales right out our windows and did many times. The sunsets were awesome, every night and the sound of the waves crashing on the rocks lulls one to a peaceful rest. God's great majesty is displayed everywhere you look from the shoreline, to the whales, the sunsets, the weather, sights and sounds of nature. I want to live here.